My name is Katie Drafs and I am the artist and owner of Lady Phoenix Art LLC. I was born and raised in beautiful Whatcom County, in Washington State, and that is where I still reside. 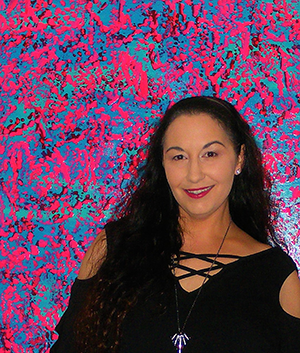 My love of painting started in High School with oil landscape paintings which has progressed and morphed into what I do now “Molecular Attraction” style of abstract painting. My style now is a more free-form abstract style of painting, based on nature’s playful and, sometimes odd, color combinations and abstract patterns. As an abstract artist I breathe fresh life into abstract art by creating never been seen before works of art that are bold, vibrant and unparalleled. I pushed the boundaries of abstract art and in doing so created a technique all my own called “Molecular Attraction” style of abstract art. With a color pallet so bright and style so different I offer the art world paintings that are truly extraordinary. My process starts by layering and blending several colors that complement each other onto the canvas. I then blend colors on top of that by hovering a pallet knife loaded with paint and, being very careful not to touch the canvas, use a swiping motion across the canvas. The hairs of the canvas and the ridges of the background paint reach up and grab the paint I have on the pallet knife, this allows the paint to break randomly which adds a sense of depth, contrast and visual interest. This creates a one of a kind abstract painting that cannot be created again. With unbridled joy and passion, each painting I create is truly unique. The bright, vibrant and bold color pallets I use creates a spontaneous dance of colors on the canvas which creates a sense of play. My goal with each piece is to invoke the emotions and allow the imagination to take over. My enthusiasm for painting does not stop there, I believe in giving back to those in need. My mission is to spread awareness to some organizations that I am passionate about. That is why I donate 20% of all my sales to these organizations, in alphabetical order; American Foundation for Suicide Prevention, Cocoon House, K9’s for Warriors, and The Rainforest Foundation US. If you have never heard of these organizations please check out their websites.